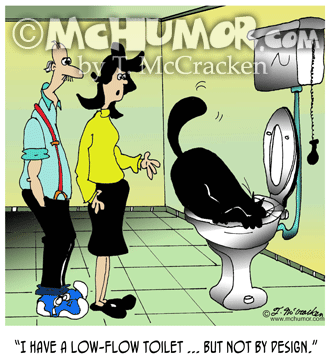 Plumbing Cartoon 7038: A woman looking at looking at a cat drinking out of her toilet saying, "I have a low-flow toilet ... but not by design." 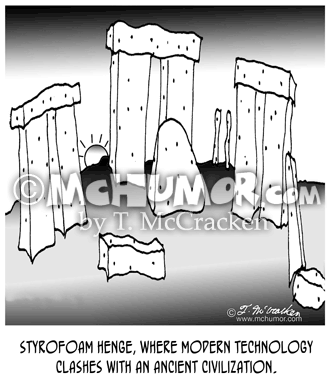 Environment Cartoon 6117: "Styrofoam Henge, where modern technology clashes with an ancient civilization." 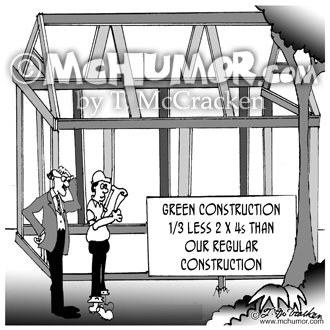 Green Cartoon 9070: A building under construction with a sign, "Green Construction, 1/3 less 2 X 4s than our regular construction." 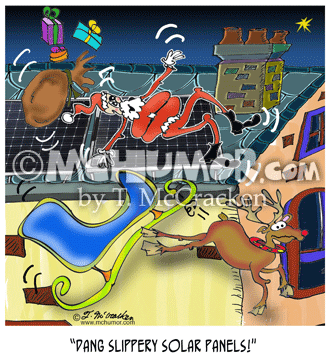 Solar Cartoon 8868: Santa thinks, “Dang slippery solar panels!" 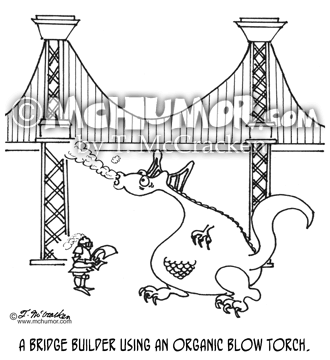 as he and Rudolph slide off a roof's solar panels. 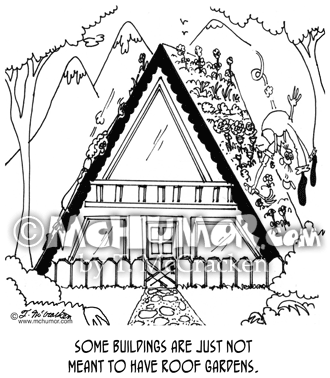 Garden Cartoon 6432: "Some buildings are just not meant to have roof gardens." On a steep pitched A-frame a gardener rolls off. 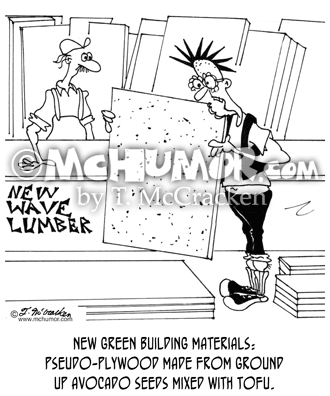 Lumber Cartoon 6426: "New green building materials: Pseudo-plywood made from ground up avocado seeds mixed with tofu." 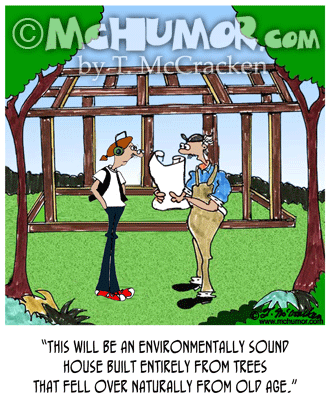 A punk eats a board. 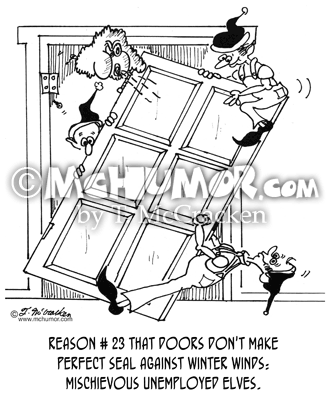 Elves Cartoon 5979: "Reason # 23 that doors don't make perfect seal against winter winds: Mischievous unemployed elves." 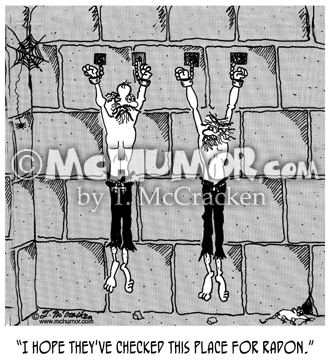 Elves remove a door from its hinges.